ShareFest is here again and provides a great opportunity to help our neighbors. SHAREFEST is an event that was created with the belief that churches and organizations can do more together than any one group could do separately to reach out to our community. This will be our third year to participate. We will be working by landscaping, painting, doing light construction and cleaning up neighborhood grounds. In addition to landscaping and cleanup, help is needed in the kitchen, possibly with child care and as runners. Runners will drive to obtain materials the work unit might need to complete a job. We will be working at Highland Park High School at 2424 SE California. Work hours are 8:00 to 12:00. Registration is open to individuals 12 years old and older until April 7. Lunch and T-Shirts are provided. Question and registrations can be given to Teresa Stambaugh at tstambaugh@cox.net. 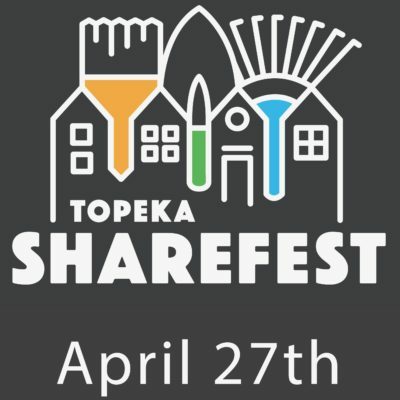 You can also register online at www.sharefesttopeka.com. Don’t forget to invite a friend!